Deriving its inspiration from Khmer culture and people, who welcome and graciously host guests, this Siem Reap hotel offers you the opportunity to experience the wonderful embrace of Cambodian hospitality at its finest. Our sole mission is to make your stay the most memorable experience possible, to ensure your complete satisfaction. We want you to be genuinely happy with our Angkor Wat cultural heritage and hospitality. The most popular temples among visitors to Siem Reap are Angkor Wat, Ta Prohm and Bayon, and almost every tourist makes sure to visit these three temples. Our Resident Host is here to make any arrangements you want, even to places beyond the temple tours. Whatever sites you want to visit in Siem Reap, we are here to help. Plan your daily trips and tours with the help of our Resident Host. When you stay at Lotus Blanc Hotel, you will enjoy 24-hour room service. You can be sure that your order will be filled quickly and exactly as you wish. We offer this special service to all guests, any time of day or night. When you arrive in a beautiful wonderland of Angkor Wat, we can arrange for you a convenient Airport Transfer. 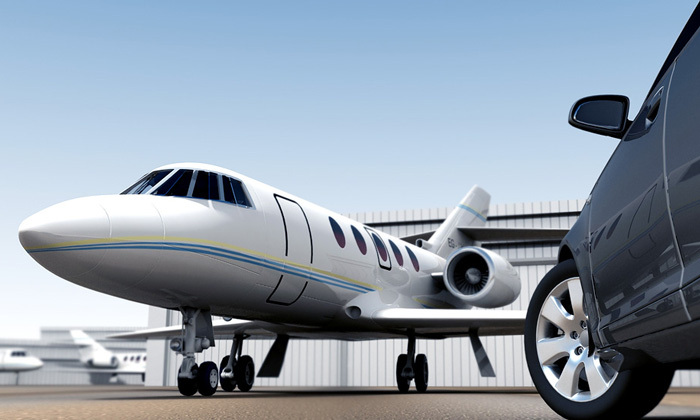 Just simply give us your flight details when you confirm your booking online through our website. We have a medical doctor on immediate call at all times to provide you with the best healthcare services should you need them. You can rest assured that if you need medical help, you will receive the prescribed treatment quickly and professionally. You don’t have to worry about feeling isolated when you stay with us. 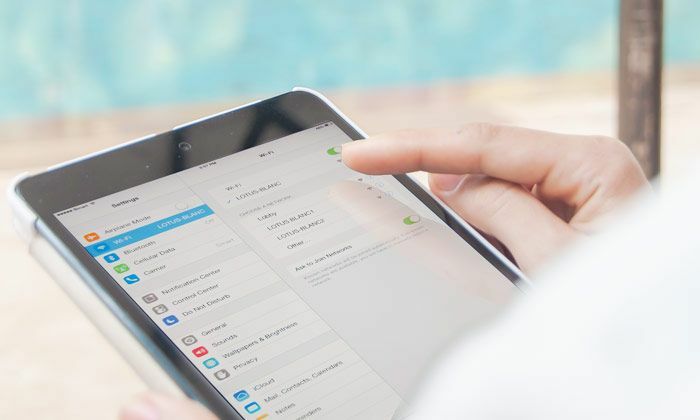 Using your laptop or smartphone, you will have access to not only FREE Wi-Fi, but with high-speed Internet connection so that you can communicate with your family and friends, and even work from your hotel room very conveniently. The facilities at this Siem Reap hotel were inspired by the elegance of French art, with the décor and design blending seamlessly with Cambodian cultural touches to offer you a one-of-a-kind experience with a mix of two worlds. The establishment of the Lotus Blanc Hotel strives to preserve the country’s Cambodian/French colonial history by offering guests a highly unique atmosphere, making it one of the most sought after hotels in Siem Reap and among the best in all of Cambodia. 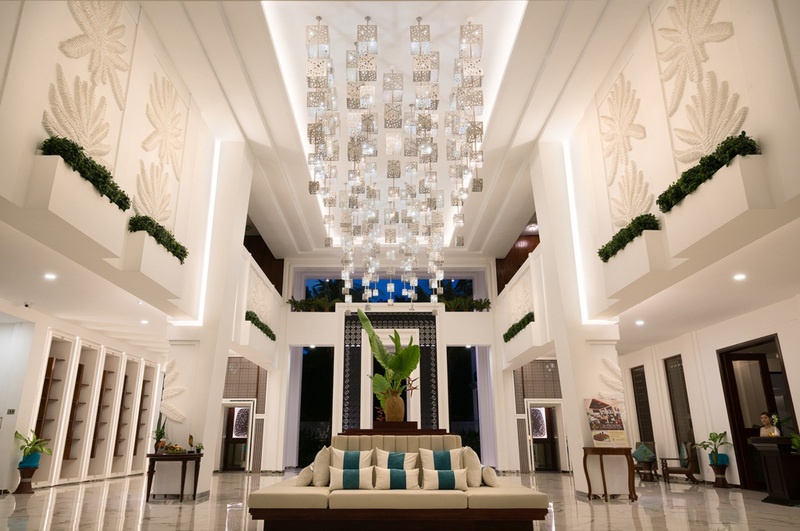 Our elegant yet contemporary Cambodian heritage design and architecture lobby has a lounge overlooking a beautiful lotus pond with an array of colorful exotic fish swimming around to greet you at the entrance when you arrive. Our Resident Host is there to personally welcome you to our hotel with a few selections of our signature drinks. 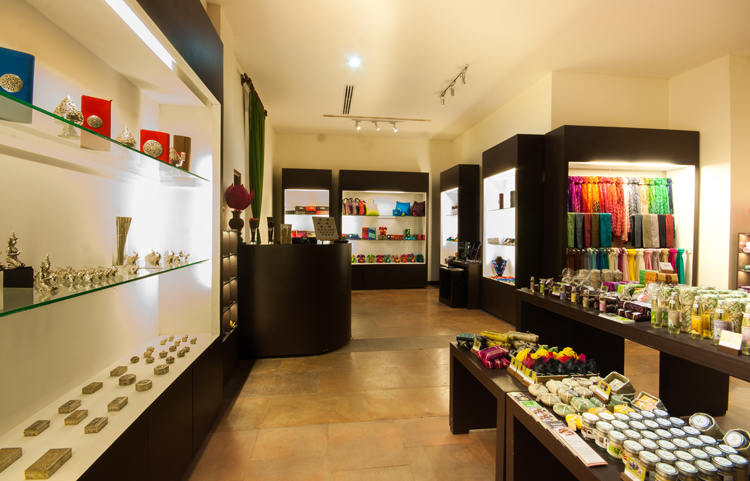 The Nirann is a high-end boutique gift shop that sells top quality beautifully made Cambodian items, such as Khmer handbags and silk scarves, wooden artwork, silver and stone carvings, etc. You don’t have to spend hours shopping around in the local markets, The Nirann makes your time very decisively with our special selections that meet almost everyone’s favourites. 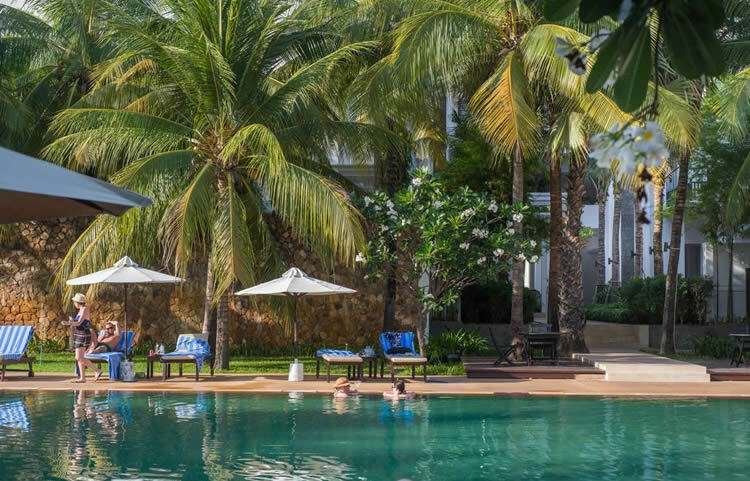 Our 25-meter rectangular swimming pool is the only stadium-sized pool in Siem Reap that has a tropical landscape rimmed with large coconut trees, making it a wonderful place to escape and relax for an afternoon. 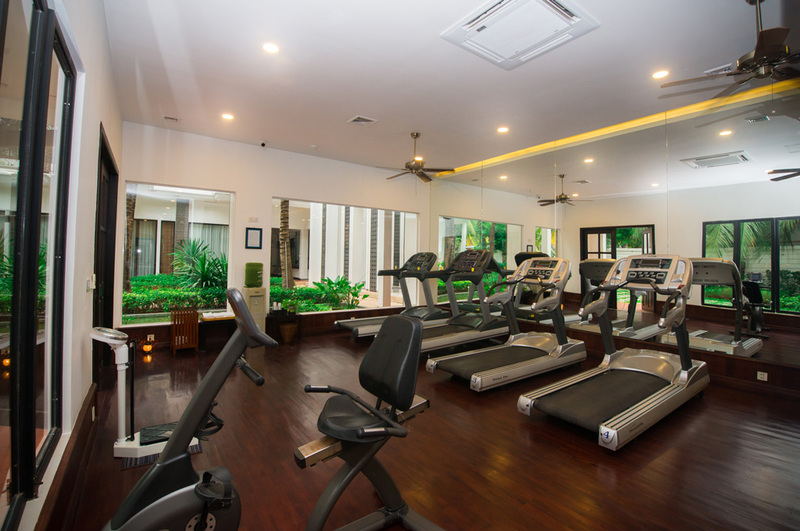 This is a fully equipped gymnasium that has a range of cardiovascular exercise equipment that you can enjoy while watching a satellite flat-screen TV. You can do your workout while viewing the coconut trees outside, which most likely motivates your mood and boosts you more energy. 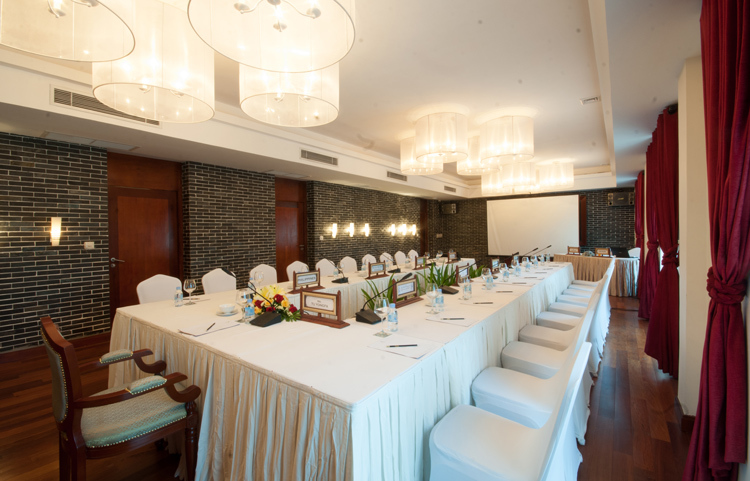 Our Morakot Meeting Room is elegantly designed and offers all the latest technological conveniences, making it one of the most impressive meeting spots in Siem Reap. This room can accommodate from 25 to 30 people comfortably and can be set up as a theater, u-shaped meeting arrangement, classroom, and/or banquet room, according to your specific needs. 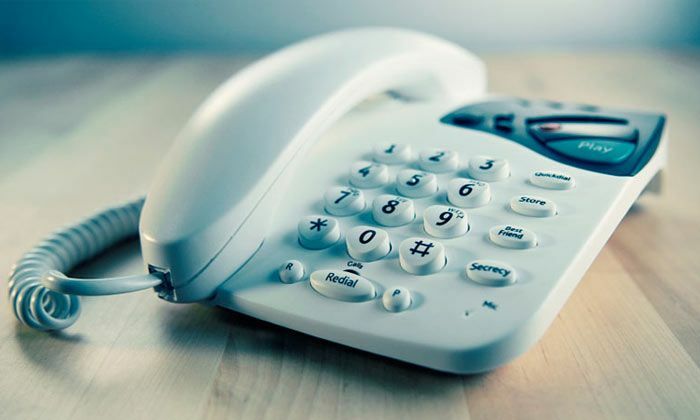 We provide high-speed Wi-Fi, a flip chart, whiteboard and any other things you require for your meeting.